In looking into the story of Diego Rivera and his murals in Detroit, I found myself following all sorts of stories I hadn't dreamed would interest me, but they did, big time. So now I am trying to pull them together into something comprehensible. In doing this, I remembered why I so loved history: I love it because it or rather almost any scrap of it has loose threads that connect to other scraps which connect us intimately with the past. And the past is only a moment ago. Anyway, today I found another scrap. I won't pursue this anywhere as far as I have the Detroit murals stuff (I don't have time!) BUT it is definitely worth following. This scrap is a piece of the story of anarchism in the United States and Russia and of some of its major participants. I have a funny feeling that if I looked far enough, I could tie it to the Diego Rivera stuff. Of course this discovering of and weaving together of various themes is one of the blessings and curses of the internet. There is a series by writers about writing in the New York Times called "Draft". Today's piece was "A Collaborative Effort" by Karen Avrich. 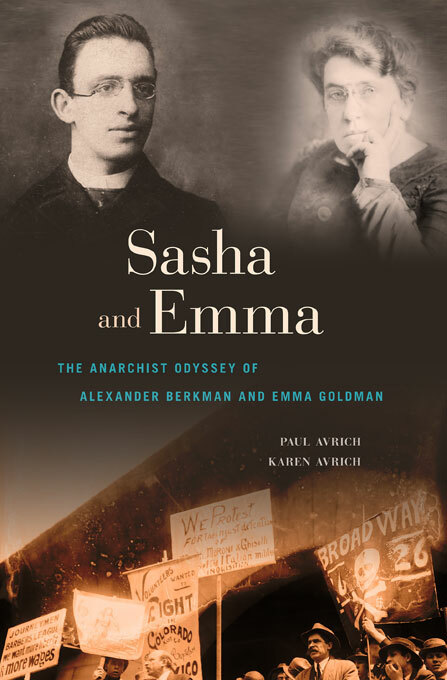 Avrich became her father's posthumous collaborator in a biography of Emma Goldman and Alexander Bergman, two very important adherents of anarchism in the late nineteenth and first half of the twentieth century. Karen Avrich's father, Paul Avrich is a leading if not the leading scholar of anarchism and worker rebellion in Russia and the US during that time. Karen Avrich creates a deeply loving sketch of her father. She also talks of how she was enveloped in the work of finishing his book. And so I have found myself following the threads of Karen Avrich, Paul Avrich, Emma Goldman and Alexander Bergman, just in a cursory google-y kind of way, but I find it amazing that I can trace them and their histories and other histories sitting at my desk in Xico. I wanted to learn more about Paul Avrich, basically a quiet man who wrote and wrote and breathed life into the anarchists. Of course you can find material on Paul Avrich on google. If you read Spanish, this is an interesting link. In looking for information on Avrich the father, I arrived at the Kate Shipley Library, a treasure trove of anarchist literature and history, of primary sources, the creme de la creme for writing history. And then there's this bit of gossip about Karen Avrich who turns out to be Mark Halperin's girl friend. The book that Paul and Karen Avrich collaborated on, Sasha and Emma,was well-received and sounds like it would be absorbing and lively. Here is the NYTimes review. It was a NY Times notable book in 2012. If you aren't up for anarchy, how about trying Alex Berensen's essay for Draft. Berensen writes a series of thrillers centered on an agent, John Wells. The plots, which Berensen hangs on a careful and accurate use of history, could lead you down a path of research on terrorism, Al Qaeda, and the like. I HAVE to try to be more disciplined. I really do want to get through Diego Rivera in Detroit! Yesterday I said without qualification that Mexico was in North America because it lay on the North American Plate--the plates constituting the hard crust of the earth. Jim, mi esposo, said he wouldn't say that: plate tectonics didn't exist when Mexico was first considered part of North America. And when was that? Hmmmm....Long before plate tectonics were theorized about and studied. So how did Mexico come to be part of North America? This is a nice, messy topic to research by shuffling through google. By the way, North America is not just Mexico, Canada and the US. It is also Greenland, Bermuda, Clipperton Island, and Saint Pierre and Miquelon. Huh? Anyway, Mexico is shall we say geographically part of North America because it is mostly on the North American plate. Apparently some geographers consider the part of Mexico below the Isthmus of Tehuantepec to be in Central America. The Isthmus is the narrowest part of Mexico. "People" tend to want to lump Mexico with Central America because Spanish is the dominant language in both, and, except for the giant exception of Brazil, in South America. But as was pointed out here, that's kind of stereotyping. though calling Mexico along with the other countries of Central and South America Latin countries isn't. French, Portuguese and Spanish, spoken in Latin America, are all Latin languages. (So maybe Quebec should be in Latin America as well as those two French islands). You can see, even excluding Central America, that New Spain on the eve of its becoming Mexico occupied more of North America than did the United States. The first big change (and everything Texas is big) came as the result of the Texas War for Independence from Mexico fought in 1835-1836, resulting in the Republic of Texas. While I'm not going to go into it here, this was no simple thing. *Santa Ana´s defeat of the Texans at the Alamo seems to have been a catalyst leading a sufficient number of men to join the Texans for them to finally defeat the Mexicans at the Battle of San Jacinto. Of the original defenders of the Alamo, 13 1 were native-born Texans [Texians] with, according to Wikipedia, 11 of those being of Mexican descent. One of them at least, Juan Seguín, still has descendants in San Antonio including my former boss at the University of Texas Health Science Center who was quite clear that he wasn´tof Mexican descent (except insofar as the area had become Mexican) but of Spanish descent, one of the people who came from the Canary Islands. You might also like to know that at least until the 1990s -- maybe no longer-- there were Mexican descendants of the owners of what became the King Ranch still in court trying to reclaim their land. Slavery was banned in Mexico, and when Texas gained its independence from Mexico, it legalized slavery. Mexico and the US disputed the border of the State of Texas with Mexico claiming that it was the Nueces River, the US claiming it was the Rio Grande (Rio Bravo in Mexico). In the map below you can see that the Nueces River cuts the lower bump from Texas, more or less. The dark green section (Texas today) is divided from the light green section (Mexico today) by the Rio Grande (Rio Bravo). As a result of US insistence that the Rio Bravo be the boundary, Mexico broke diplomatic relations with the US. And this pretty much marks the beginning of the First War of United States Intervention in Mexico, or as the US says, the Mexican American War. The two countries have noticeably different ideas about this war, and it is really worth learnig about them. A short piece in English talking about the Mexican version can be found here. In fact the PBS site covering the US-Mexico war is very good and has quite a number of Mexican and Mexican American authorities as well as a good list of resources. It is really worth looking this stuff up and unlearning some of the history at least I was taught. The result of the First US Intervention in Mexico (you have to know the US also directly invaded Mexican territory, including Mexico City) is that Mexico lost about 55 percent of its territory and ended up in the shape it is today. This was not only a result of the battles, but of the US rewriting, on its own, the treaty the two countries had agreed on. The map below shows the negotiations over the Mexican border from 1845-1848. The last little bit, between the red line and the dotted-dashed line to the south, representes the Gadsden purchase of an area called La Mesilla. The US bought it for ten million dollars, threatening Mexico with more war if it wouldn't sell it. Obviously, the Mexican-US war is another topic on which I could go on forever. For the purposes of the original discussion, however, which was over why Mexico was in North America, as you can see that it only was reduced to its current size in 1848. So it was part of North America in its combined role as Mexico and part of New Spain, established in the 16th century, for longer than the United States was even the British colonies. Note: The edition I did the index for is available for preorder at Amazon. I did not do the index for the currently available edition. I had meant to retire from indexing. I stopped looking for work. Then a book came along that was really tempting, so I did it. And then some more. So I am still indexing. I have just finished three books that were very time-consuming, so I haven’t blogged for a while. I’d like to mention the last one. It is a Western Civilization text book called just that: Western Civilization. Originally two volumes, it has been condensed to one, and that’s what I indexed. The author is Jackson J. Spielvogel. I had not heard of him, but I sure wanted to find out about him after I started reading. He is now an emeritus professor at Penn State where he has won great renown as an outstanding teacher and textbook writer. The book Western Civilizaton is extraordinary for a number of reasons. Spielvogel writes about all kinds of people, not just kings and queens and presidents. He often reminds us that throughout history, most people have been ordinary people: not rich, not fancy, not influential in the world, but nonetheless they have been by far the largest number of people, and their fates have often lain outside their own hands: they’ve had to serve in armies, they’ve been victims of disease, they’ve been slaughtered and brutalized and made serfs and enslaved. More or less chronological, the narration nonetheless does not provide a long list of dates to remember. Rather, Spielvogel provides glimpses across the years of a century, say, of the effects events and people had on each other: religion on rulers, loss of meaning on art, the Black Death on people’s attitudes towards being alive. There are few heroes. There is no underlying belief in progress or a happy ending. Rather, currents ebb and flow. Capitalism is not the salvation of man, nor is the Enlightenment idea of progress. In fact, the Enlightenment itself, at this point such an unexamined foundation of much US and western culture is presented as more or less as one of many systems of thought and belief which were efforts to give sense and order to life. That’s not quite fair. Spielvogel addresses the very real achievements of science and art, among other things. But he certainly doesn’t consider Enlightenment thought the path to salvation. I will just stick in here the fact that in Spain at least, the Enlightenment, contrary to its influence in England and France, was used to justify the inequality of human beings: to explain to the peasants and the merchants and the servants that hierarchy was the natural order of things, and they were on the bottom rungs. Groups that receive short shrift in other texts, or at least the ones I know of (and I am WAY out of date) are here in sympathetic detail: Jews, women, prostitutes, for instance. Gays. When he discusses art and music and literature, he introduces people I’d never heard of but who nonetheless in some significant way personified their eras or changed them. Art and music and literature are not apart from history but woven right into its tapestry. It’s a wonderfully readable book. If you want to once again after many years dig into Western Civ, do it with this book. It was so readable I spent too much time reading it and ended up probably giving the index short shrift. We've got ruins right nearby! Slow blogging again. I'm busy finishing up what I think are the next to the last and last indexes before I "retire." When I gave up clinical social work is when I actually think of myself as not so much retiring, but facing the upheaval of leaving work I loved for the green(ish) fields of Texas where I started doing a whole lot of other things that people who are privileged to have some resources can do. But this is "retirement" in the sense that I will actually be getting social security which will give me about as much money as I get indexing. I feel as if I am talking about someone else when I talk about such things as Social Security and Medicare: that's for old people! Today I am simply posting some websites for archaeological projects. The first two sites deal with a dig going on at El Carrizal, about an hour east of us, which I find quite exciting because we can to it pretty easily. It is an Olmec site. You can see stuff about the Olmecs here and here on my blog. It is very extensive. The first website takes you to a blog in Spanish, the second to one in English. Those of you who've lived not just in the US's southwest, but midwest and east and south may be very interested in two links here and here to websites dealing with current archaeology in those areas. Pretty soon we will have an entirely different perspective of what was going on before the English and Spanish and French arrived. It was a large and busy area. These sites have lots of good photos and discussion.